Out-of home media player oOh!media has not let its proposed $570 million acquisition of Adshel distract it from delivering solid revenue growth in the first half of 2018. The company’s revenue totalled $192 million for the six months to 30 June 2018 – up 11 per cent on the prior corresponding period – while oOh!media’s underlying net profit after tax lifted 3.4 per cent to $9.2 million. Underlying expenses before interest, taxes, depreciation and ammortisation rose by 11 per cent to $37.9 million. Digital revenue as a percentage of oOh!media’s total sales climbed to 64 per cent during the first half of 2018. The company’s Locate division saw the biggest increase in revenue, up 30.8 per cent to $20.8 million. Brendon Cook, CEO of oOh!media, said: “oOh! 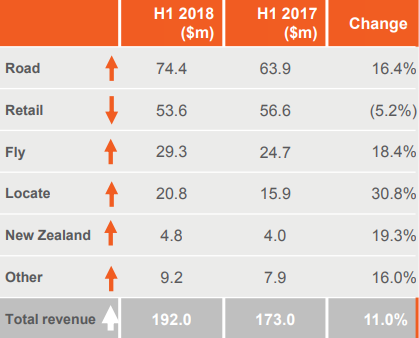 has delivered another strong result with solid revenue growth demonstrating the value proposition of our product offering across the most diversified portfolio in the industry. “That diversity provides exposure to the broadest range of out-of-home segments and underlying lease contracts, enabling us to deliver sustainable revenue growth while also mitigating periodic fluctuations in advertiser spend in specific categories and products. Cook said this year marks a transformation in oOh!media by building its platform to the next level. “We are leading the industry in creating a new media business that is driven by data, content and innovation, connecting advertisers to more audiences with the right message, at the right moment and in the right location,” he said. “We are supporting this with an Organisational Transformation Platform that harnesses the power of machine learning to enable clients to engage with audiences through our extensive network of signs more easily, effectively and efficiently.